Home / Dechlorination Systems for Chlorine Removal / Under Sink Lead Removal System. Under Sink Lead Removal System. Mineralpro’s undersink Lead Removal system is a complete system with faucet, high quality lead removal filter and connection fittings. Ideal unit for customers wanting to remove the lead from their water prior to drinking or using for cooking. This unit mounts easily under your kitchen sink and comes with a faucet to dispense your safe water! 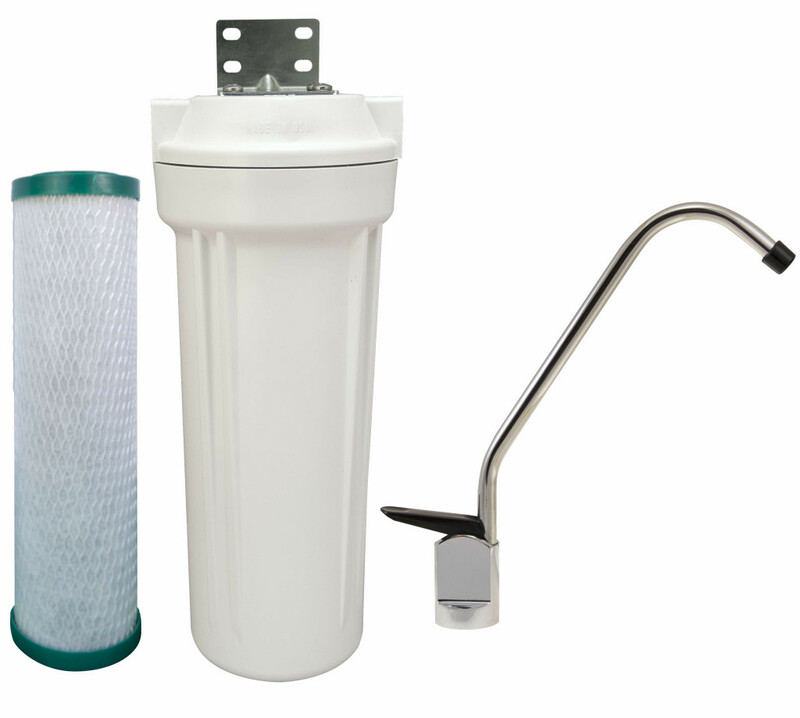 Mineralpro’s under-sink Lead Removal system is a complete system with faucet, high quality lead removal filter and connection fittings. Complete unit with faucet, mounting bracket, high quality Lead and Chlorine removal filter, connection fittings and tube. MineralPro’s under sink lead reduction Filter uses replaceable extruded activated carbon filters to reduce soluble lead using an ion-exchange filter medium with high specicity for soluble lead. Particulate filtration is used to intercept insoluble lead-containing particles. Standard 2.50” O.D. x 10” L filters will reduce lead, meeting the performance requirements of NSF/ANSI Standard 53 protocol for over 2,500 gallons when operating at a flow of 0.75 GPM.